Background: Adoptive immunotherapy with tumor-specific TCR gene-modified T cells has the potential to eradicate bulky disease. Traditional methods of TCR identification require lengthy in vitro culture to generate clonal T-cell populations, which adds time and complexity to this promising therapy. Here we described a simplified and reliable method to identify TCRs by single cell TCR sequencing of cells sorted with antibodies against T-cell surface markers that are up-regulated only when they are stimulated with specific tumor cell antigens. Methods: A tumor-infiltrating lymphocyte (TIL) culture with T cells reactive against autologous tumor was generated from a brain metastasis of a patients with NSCLC. A panel of antibodies against T-cell surface antigens was screened to identify markers that are specifically up-regulated after stimulation with autologous tumors but not with related allogeneic tumor cells. Tumor-specific T cells were sorted from TIL with three suitable antibodies and expanded by a rapid expansion protocol. Expanded T cells were examined for their tumor-specificity and subjected to single cell TCR sequencing using the 10X genomic system. The top 10 TCRs were identified by bio-informatics approach and the corresponding alpha and beta chains were synthesized and cloned into a retroviral vector based on MSG backbone. PBMC from healthy donors were transduced with the retrovirus supernatant after activation. Tumor- reactivity of transduced T cells was determined after expansion in media supplemented with IL-2, IL-7, and IL-15. To identify tumor-specific TCRs in PBMC from the same patient after vaccination with allogeneic DRibbles, we also developed a protocol to expand tumor-specific T cells from PBMC with in vitro stimulation with DRibble- loaded PBMC. Results: We identity CD94, CD137(4-1BB), CD355 (CRTAM) as specific markers for antigen-specific activation of T-cells by autologous tumor cells, whereas other “check point” markers such as CTLA-4, PD-1, Tim3, CD39, CD103 were up-regulated by stimulation with unrelated tumor cells. These antibodies were successfully used to sort and enrich tumor-specific T cells. The top 10 TCRs from each sorting were different but with overlapping clones. Five TCR clones were tumor-specific and capable to recognize the autologous tumor cells when they were expressed on T- cells from health donors. Additionally, ex-vivo culture of vaccine stimulated PBMC from a post-vaccine timepoint generated T cells enriched for activity against autologous tumor. Conclusions: We developed a simplified work flow to identify tumor-specific TCRs. This flow will be further improved with antibody with DNA bar codes and used to identify tumor-reactive TCRs in a streamlined fashion. Acknowledgements: The study was supported by Providence Portland Medical Foundation and NCI SBIR grant R44 CA121612. 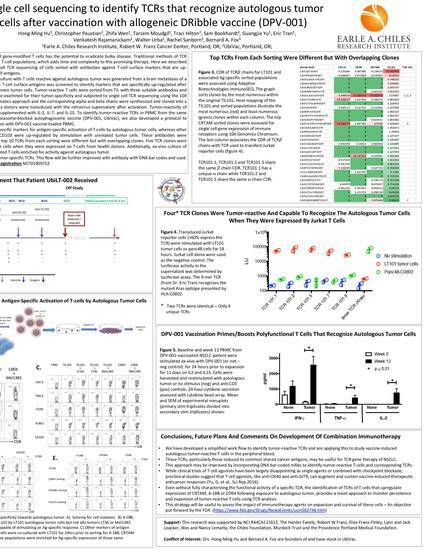 Poster presented at Society for Immunotherapy of Cancer Annual Meeting, Washington, D.C., November 7 – 11, 2018.